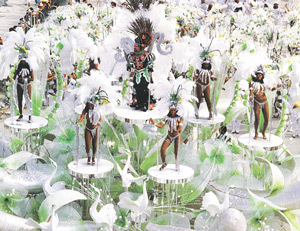 The Carnival, which takes place every February, turns the already vibrant city of Rio de Janeiro into a raucous knees up. Street dancing, fantastic outfits, a tropical climate and partying until dawn are compulsory. After all, a million people can't be wrong. Thrill to the Samba School Parade! Our Grandstand Ticket Package is only $690. Carnival in Rio, Brazil's world-renowned celebration, takes place 40 days before Easter, just preceding Lent. Crowds gather on the Sambodromo at Marquês de Sapuca?Avenue to view the parade of samba school dancers, which for months meticulously prepare their shows featuring thousands of dancers in extravagant costumes, music, song, and elaborate decoration. Join in the Carnival Parade! *Rates are in US dollars per person based on double occupancy land only. International airfare available at additional charge. Visa to Brazil is required for American passport holders, and must be issued prior to departure, fees are not included. Travel insurance is highly recommended and available for $155 per person.